This rare TI-5230 seems to be an enhanced version of the TI-5225. We notice 16 added keys compared with the basic calculator but [START], [STOP] and [ENTER] are not common labels for a simple desktop calculator. We decided to dismantle the TI-5230 to reveal its true genes and found a real surprise under the cover of the huge housing. Please watch the following 4 pictures carefully. The internal construction of the TI-5230 is a typical design of Texas Instruments. We know the style from the TI-5225 but notice two stacked printed circuit boards (PCB's). The lower PCB makes use of two single-chip calculator chips to control both the thermal printer and the display. Looking closer on the upper PCB gives with the TMC0501 Arithmetic chip and lots of memory a real surprise ! With the TMC0501 building blocks Texas Instruments created a novel architecture for scalable scientific calculators. 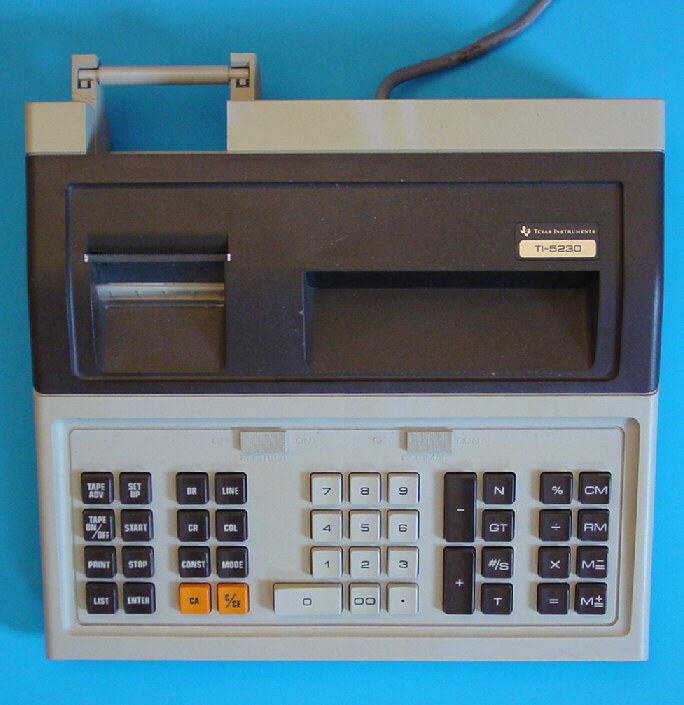 The architecture used minimum a 2 chip design with the Arithmetic chip and the SCOM (scanning read only memory) but was expandable to a maximum of 8 SCOM's, additional RAM as program memory for programmable calculators, additional RAM for general purpose registers and even a chip driving a printer. Most scientific and programmable calculators from Texas Instruments between the years 1974 and 1982 rely on these chips. Please find all known calculators using the TMC0501 architecture here. Overall the complexity is centered between the well known TI-59 and the flagship SR-60A! © Joerg Woerner, June 11, 2005. No reprints without written permission.